Recent National Mental Health Survey (2015-16) reported a prevalence of 13.7% for any mental disorders excluding tobacco use disorders in India. Translating it into real numbers, nearly 150 million people need active mental health interventions, disproportionately more in rural areas. Major challenges in delivering comprehensive mental health services in rural India are: a) lack of a well-defined strategy; and b) lack of trained mental health manpower. To fill this gap, the global mental health community has increasingly realized the importance of Community Health Workers (CHWs) and role of stepped care approach in mental health service delivery. We propose a model of stepped care approach to fulfil the need of rural India, utilizing the existing health system components for improving mental health knowledge, reducing social stigma for mental disorders, screening for priority mental disorders at community level, ensuring compliance to treatment, timely follow-up, and community-based rehabilitation by mobilising community support for diagnosed cases. This stepped care approach will integrate mental health into Ayushman Bharat’s Health and Wellness Centres (HWCs) for the provision of comprehensive primary health care. Integration of new age technologies such as telepsychiatry, e-health, and mHealth into the proposed model will make it feasible and cost-efficient for inaccessible parts of the country. Mental disorders are the leading causes of disability globally. One in four people in the world are affected by mental or neurological disorders at some point in their lives. The high incidence of mental illness and substance abuse disorders in low- and lower-middle-income countries can lead to an economic trap of disease burden and social decline. The term, “mental disorders” is often used synonymously with mental morbidity, mental health conditions, mental illness, and mental health issues. In India, the recent National Mental Health Survey (NMHS) 2015-16 revealed a prevalence of 13.7% for any mental disorders excluding tobacco use disorders related to tobacco use. Earlier epidemiological studies documented that the prevalence of various mental disorders varies from 9.5 to 370 per 1000 population in India. India is also regarded as home to an estimated 57 million people (18% of the global estimate) affected by depression. Translating the magnitude of mental disorders into real numbers, nearly 150 million Indians are in need of active mental health interventions. In order to achieve universal health coverage (UHC), India has launched its ambitious Ayushman Bharat (Healthy India) programme in the alignment with its National Health Policy 2017. Ayushman Bharat has two components; health and wellness centres, and national health insurance protection scheme. In the charter of health and wellness centres, a list of 12 services are identified including mental health services which have been neglected in the past. This becomes important at this juncture of time as the burden of mental disorders are rising although provision for mental health services are not improving. Not only the burden of mental disorders is high, but their impact on individuals and society is also widespread and greater than many major medical conditions. For instance, India accounted for 16.4% of global disability-adjusted life years (DALYs) attributable to mental and substance use disorders (28 million DALYs). Due to the prevailing stigma, mental disorders often are hidden by the society, and consequently, persons with mental disorder live with a poor quality of life. With significant disability and functional impairment, the economic burden associated with mental disorders is expected to be high, mainly due to loss of productivity. Therefore, we proposed a cost-effective model of stepped care approach based on existing cadres of the community health workers, which may help the country to achieve the goals of NHP 2017 and sustainable development goals (SDGs) through universalization of comprehensive mental health care. Globally, 76% to 85% of people with severe mental disorders in low and middle-income countries receive no treatment for their mental disorders. A similar gap is reflected in India as well. Although several cost-effective interventions demonstrated a significant decrease in the burden of mental disorders, associated treatment gap remains very high due to reasons ranging from non-availability of services to prevailing stigma. Recent NMHS findings reported an overall treatment gap of 83% for any mental disorders. Only about 10% of people with mental disorders are thought to receive evidence-based treatments in India. Mental disorders have received poor attention in the health programmes in India. In addition, limited reach and slow expansion of mental health programmes and services also existed due to inequitable distribution and inefficient use of resources for mental health care. Addressing the mental health care needs of India’s vast population with limited resources will have global implications towards the achievement of mental health-related sustainable development goals. This calls for scale-up mental health services in India, by adapting successful models and developing and integrating innovative, cost-effective and self-sustainable interventions within these models in the Indian context. The severe deficit of mental health workforce remains a major challenge in delivering comprehensive mental health services in rural India. For instance, there is fewer than one psychiatrist (0.3) for 100,000 population. Whereas the average national deficit of psychiatrists is estimated to be 77%, it is more than 90% for one-third of the country’s population. This clearly implies that the huge burden and treatment gap associated with mental disorders would not be easy to tackle by currently existing psychiatrists alone. At the same time, the insufficient training (1.4% of the total lecture time) of psychiatry during the undergraduate medical curriculum renders non-psychiatrist physicians unprepared to competently deal with mental disorders. Studies from India have reported that primary health-care professionals are often inadequately trained, and reluctant or unable to detect, diagnose, or manage common mental disorders. In addition, there is a great disparity in the distribution of psychiatrists among cities and villages in India. This leads to inadequate treatment services, continued suffering and premature deaths, stigmatization, and poor investment in mental health. This warrants for a rational redistribution of mental health services, known as task-sharing, from mental health specialists including psychiatrists, psychologists, and psychiatric nurses to non-specialist health workers in primary care and community settings through the integration of mental health into primary care. Even though India was the first country in the world to attempt to integrate mental health services at the primary care level through National Mental Health Programme (NMHP and District Mental Health Program (DMHP), its endeavor to bridge the treatment gap and decrease the deficits in human resources failed to gain the desired momentum. Community-based participatory research to address mental health has been tried in various studies in different countries. In these studies, community health workers (CHWs) educated up to 10 years of schooling were trained to provide non-pharmacological interventions in patients with both severe as well as common mental disorders., Such interventions are effective in improving the clinical outcome as compared to those receiving ‘care as usual’. Since the launch of National Rural Health Mission, now known as National Health Mission (NHM) in 2005, trained manpower [Accredited Social Health Activists (ASHAs), Multipurpose workers (MPWs), Doctors, etc.] has increased enormously. Under the NHM, around 0.9 million ASHAs have been selected so far. By 2016, there were 2, 12, 185 female MPWs, 55,657 male MPWs, 12,646 male Health Assistant (HA) and 13,372 female HAs working in Primary Health Centres (PHCs) in India. ASHA is a voluntary community health worker who is selected from the village itself and accountable to it, she is trained to work as an interface between the community and the health care delivery system. Both male and female MPWs work at sub-centre which is the lowest level of the health care delivery system. The minimum qualification for MPW (Male) is 12 years of schooling with biology or science as a subject, and for MPW (female) is 2 years Auxiliary Nurse-midwifery (ANM) course following 10-12 years of schooling. These courses focus predominantly on maternal and child health (midwifery) and communicable diseases with a minimal focus on mental health. Under the supervision of the Medical Officer-in-charge of a primary health centre (PHC), ASHA at the village level, MPWs at the sub-centre level, and HAs at PHC level provide promotive, preventive and curative services as appropriate for that level. However, there is no specific training as far as mental health issues are concerned. There is an urgent need to address the large gap in human resources in mental health. In addition, improving the knowledge about mental health and elimination of social stigma and discrimination associated with mental disorders is another major challenge to address the mental health needs. The early identification of major mental disorders with appropriate linkage to evidence-informed management and timely follow-up remains the key to improved mental health care. The stepped care approach is a successfully tested model that can be adapted and integrated with primary health care in rural settings in India, with appropriate modifications [Table 1] 20,22 A stepped care approach improves the coverage of mental health services, making the best use of available local workforce and technologies for a better match with individual and population needs. Subsequently, increased community engagement acts as a mean of advancing inclusion and opportunities for community participation. It thus provides an appropriate mechanism for people to avail mental health services at their doorstep with affordable cost compared to the conventional clinic-based approach. Community health workers i.e. CHWs (ASHAs, MPWs, and ANMs) have a very important role in the stepped care approach. Next section summarizes how these CHWs can fit into the stepped care approach playing unique roles. ASHAs: Given their vast numbers and immense penetration into the community health affairs, ASHAs can make a significant impact on the mental health care. They, if appropriately trained in handling mental health issues, may be able to provide the ideal linkage between the community and the mental health services at the PHCs (now Health and Wellness Centres), and further referrals to specialty psychiatry clinics. ASHAs can work in tandem with MPWs (both male and female) to improve knowledge about mental disorders (mental health literacy) and reduce social stigma and discrimination associated with mental disorders. ASHAs are cognizant of the socio-cultural milieu of the community (which is vital for identifying mental disorders with varied cultural interpretations and understanding the precise psychological phenomenon) and have help-seeking dynamics and regular contact with the families to ensure compliance with the treatments administered. ASHAs, being a part of the mental health workforce, do not need to spend additional time on the potential psychiatric patients, since they are already engaged with the entire community. A support system can be developed to help ASHAs ensure that already diagnosed patients reach PHCs and are timely followed-up subsequently. Medical officer, in the PHCs, diagnose the disorders and initiate proper management. They may further refer only those cases which require the attention of a trained psychiatrist (at the district hospitals) and thereafter receive them back in their own care. MPWs: There are unique advantages for training of MPWs in mental health. MPWs (male and female) are the suitable workers for the screening due to their community penetration and educational background. Trained MPWs would carry out the responsibilities assigned to them-a scope to identify people with mental disorders. The screening for the priority mental disorders in the community by trained MPWs and establishing appropriate linkage between persons identified with mental disorders and the doctors at the PHCs and the psychiatrist at the district level -a critical step to strengthen mental health services in the rural areas of India. This new role can be integrated with duties assigned under the non-communicable diseases program, i.e. the National Program for Prevention and Control of Cancer, Diabetes, cardiovascular diseases, and Stroke (NPCDCS) making it cost-effective. One cost-effective strategy would be testing and developing a validated intervention package for India, based on the WHO mhGAP intervention guide. The potential role of HAs as a health counselor in mental service has been already explored in Indian settings. HAs (male and female) if trained, can act as counselors for priority mental disorders (depression, anxiety etc.) at PHC level. Thus, the involvement of ASHA at the village level, MPWs at the sub-centre level, HAs and doctors at PHC level and psychiatrist (psychiatric clinics) at district level along with their appropriate linkage will be able to provide comprehensive mental health services in rural India. This may be integrated with currently ongoing health sector reforms in India under Ayushman Bharat specifically invented health and wellness centres. Cutting-edge technologies can play a pivotal role in bridging the “mental health gap” in rural India. Mass communication media (TV, Radio, Newspaper etc. ), social media (Twitter, Facebook, WhatsApp etc.) and relevant audio-visual messages through mobile phones can be used to spread community awareness to improve mental health literacy and reduce stigma. Telepsychiatry, tele-mental health, e-psychiatry approach and mobile mental health support approach have been already explored and found to be successful and cost-effective in India.,,,, These technologies can cross-cut at various steps of the stepped care approach for integration of mental health into primary care and take it to the doorstep of patients in the community, especially in remote and inaccessible areas. Telepsychiatry is a useful technique for direct patient care (diagnosis and management), consultation, training, education, and mental health promotion. It reduces out of pocket expenditure (time and cost of transport cost, wage loss.) for patients. Telepsychiatry is an economical model mental health service delivery connecting tertiary centre and a primary health-care centre compared to traditional psychiatric clinics. While using telepsychiatry it is required that the pharmacological treatment should be prescribed only by the trained doctor, and non-pharmacological treatment can be provided by the CHWs whenever recommended. 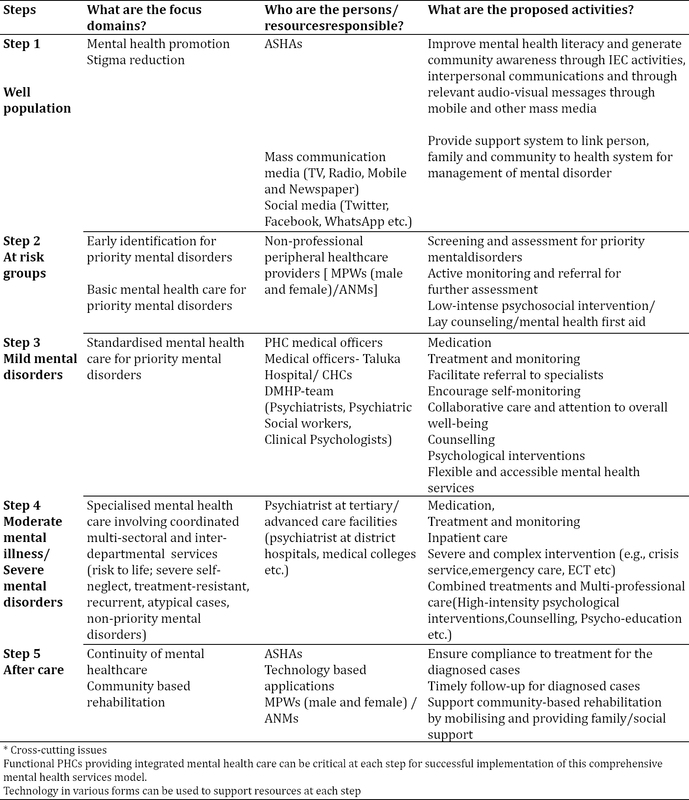 In the context of increasing use of smartphone use, mobile mental health support with appropriate app integrated with telepsychiatry will be useful and cost-effective interventions for mental health promotion, training of community health workers (ASHAs, MPWs, and HAs), screening for priority mental disorders, to improve the treatment compliance along with referral, and timely follow-up of diagnosed cases. The appropriate mobile app will be handy for CHWs to fulfill the community level tasks “what to do”, “when to do” and “how to do”. The Government of India has recently unveiled the Mental Health Policy with an accompanying mental health action plan. It has an ambitious proposal for expanding the District Mental Health Program to more than 300 districts in a phased manner. In the existing health systems, ASHAs and other health workers are an important link for delivery of services, but their roles and responsibilities for mental health care has not been delineated. Recently, the Ministry of Health and Family Welfare, Government of India has brought out a training module on essential psychiatry to impart standardized short-term training to medical officers at peripheral centres. Thus, prioritizing the mental disorders, delineating the roles and responsibilities of ASHAs, MPWs and HAs as per their skills and competencies, and training them in line with the training of medical officers at peripheral centres through strategic framework and model becomes critical. This will not only keep the momentum gained for mental health in India in recent years but also will align with the stepped care approach for successful integration of mental health into Ayushman Bharat's Health and Wellness Centres (HWCs) for the provision of comprehensive primary health care. Fortunately, mental health has been able to secure a birth in the package of HWCs, although, there is a long way to go. Although the burden of mental disorders is high, the trained mental health workforce is critically deficient in rural India. Stepped care approach is a cost-effective and time-tested strategy which can be adapted and integrated within the framework of Ayushman Bharat's health and wellness centres to provide comprehensive primary health care. Community Health Workers (CHWs) are a potentially useful and large pool of unqualified but trainable that utilized into the stepped care approach. As we make striking progress towards the unfinished agenda of communicable diseases and reproductive and child health, tapping their potentials appropriately to deliver mental health services will ensure achievement of health-related Sustainable Development Goals (SDGs). Math SB, Chandrashekar CR, Bhugra D. Psychiatric epidemiology in India. Indian J Med Res. 2007 Sep;126(3):183-92. Patralekha Chatterjee. India launches Ayushman Bharat’s secondary care component. Lancet. 2018 Sep. 22; 392(10152):997. Depression in India Let’s Talk. World Health Organisation. [cited 2018 Feb 11]. Available from: http://www.searo.who.int/india/depression_in_india.pdf. Thirunavukarasu M, Thirunavukarasu P. Training and National deficit of psychiatrists in India - A critical analysis. Indian J Psychiatry. 2010 Jan;52(Suppl 1):583-88.
WHO World Mental Health Survey Consortium. Prevalence, severity, and unmet need for treatment of mental disorders in the World Health Organization World Mental Health Surveys. Journal of the American Medical Association 2004;291:2581-2590. Patel V, Weiss HA, Chowdhary N, Naik S, Pednekar S, Chatterjee S, et al. Effectiveness of an intervention led by lay health counsellors for depressive and anxiety disorders in primary care in Goa, India (MANAS): a cluster randomised controlled trial. Lancet. 2010 Dec 18;376(9758):2086-95. Mendenhall E, De Silva MJ, Hanlon C, Petersen I, Shidhaye R, Jordans M, et al. Acceptability and feasibility of using non-specialist health workers to deliver mental health care: Stakeholder perceptions from the PRIME district sites in Ethiopia, India, Nepal, South Africa, and Uganda. Soc Sci Med 2014 Oct;118:33-42. Chatterjee S, Patel V, Chatterjee A, Weiss HA. Evaluation of a community-based rehabilitation model for chronic schizophrenia in rural India. Br J Psychiatry J Ment Sci. 2003 Jan;182:57-62. Bower P, Gilbody S. Stepped care in psychological therapies: access, effectiveness and efficiency. Narrative literature review. Br J Psychiatry. 2005 Jan;186:11-7. Van Straten A, Tiemens B, Hakkaart L, Nolen WA, Donker MC. Stepped care vs.matched care for mood and anxiety disorders: a randomized trial in routine practice. Acta Psychiatr Scand. 2006 Jun;113(6):468-76. Moirangthem S, Rao S, Kumar CN, Narayana M, Raviprakash N, Math SB. Telepsychiatry as an Economically Better Model for Reaching the Unreached: A Retrospective Report from South India. Indian J Psychol Med. 2017 May-Jun;39(3):271-275. Maulik PK, Tewari A, Devarapalli S, Kallakuri S, Patel A. The Systematic Medical Appraisal, Referral and Treatment (SMART) Mental Health Project: Development and Testing of Electronic Decision Support System and Formative Research to Understand Perceptions about Mental Health in Rural India. PLoS One.2016 Oct 12;11(10):e0164404. Yellowlees P, Chan S. Mobile mental health care-an opportunity for India. Indian J Med Res. 2015 Oct;142(4):359-61. Wang J, Lam RW, Ho K, Attridge M, Lashewicz BM, Patten SB et al. Preferred Features of E Mental Health Programs for Prevention of Major Depression in Male Workers: Results From a Canadian National Survey. J Med Internet Res. 2016 Jun 6;18(6):132. Malhotra S, Chakrabarti S, Shah R, Sharma M, Sharma KP, Malhotra A et al. Telepsychiatry clinical decision support system used by non-psychiatrists in remote areas: Validity & reliability of diagnostic module. Indian J Med Res. 2017 Aug;146(2):196-204.